Hundreds of apps gets released every month So its not easy to find out which are the best apps. In order to help you out we are publishing best 5 iOS apps of April 2013. List will include all new and old apps based on its popularity. In other worlds for new apps we conclude best apps by dividing the number of downloads with the number of days since its laucnh in the App Store. Yahoo weather, most used weather app for iOS or Android. Yahoo has added many new features to its latest version which depict your city’s images along with the weather. Other features of Yahoo Weather App is that its most accurate weather app and gives detailed weather forecasts. Drippler makes your iPhone even more awesome! It Discovers newest phone fixes, apps, and other goodies it thinks will be useful for you. Its always awesome to something new for your iPhone every day, and stay one step ahead with the latest updates, tips, apps, accessories and more. As we all know that Iron Man 3 has already collected Millions at box office but its official game is also gaining good number of downloads. The highly anticipated official game of Iron Man 3 turns out to be another endless runner, or to be exact, flier. Are you ready as addictive, endless 3D runner? A gripping depiction of the Allied invasion of Normandy, Frontline Commando: D-Day captures the horrors of war in vivid, painstakingly accurate detail. In the game you have to Defeat the occupation forces and take back France; storm the beaches, clear the trenches and liberate towns as you battle through the countryside of Normandy. A fresh approach to finding new music by using Tweets and follows to power discovery. The most popular new music and emerging talent on Twitter right now. It’s a social networking service that lets you broadcast messages, called tweets, about what you’re doing or thinking, in 140 characters or less. 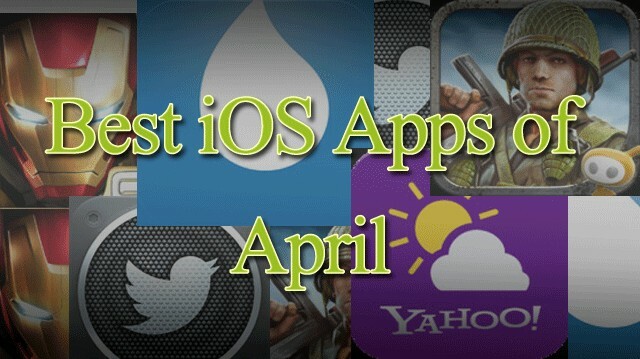 That’s it of best iOS apps of April 2013. But you guys don’t worry as there’s also best Android apps of April 2013 listed here. Also take a look at last month’s best iOS apps here. Most of the above mentioned apps are compatible with all iOS Devices.